Be the first to share your favorite memory, photo or story of Carlton "C.H." . This memorial page is dedicated for family, friends and future generations to celebrate the life of their loved one. 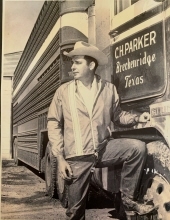 Carlton “CH” Parker, age 84 of Breckenridge, passed away Monday, February 11, 2019 in Abilene. Family is welcoming friends for a visitation on Thursday, February 14, 2019 from 6 p.m. to 8 p.m. at Melton-Kitchens Chapel. Graveside services will be held on Friday, February 15, 2019 at 2pm at the Hart Cemetery. Arrangements have been entrusted to Melton-Kitchens Funeral Home. Carlton Hugh Parker, the son of Hoye and Willie Parker, was born in Breckenridge, Texas on September 25, 1934. C.H. graduated from Breckenridge High School in 1953 and later attended Tarleton State, after two semesters he returned back to Breckenridge for the summer and purchased a cattle truck. The rest was history, lots of hauling cows and no more college. C.H. married Shirley Handrick in November of 1954 and raised his growing family here in Breckenridge most of their lives. He was involved in buying and hauling cattle most of his life. C.H. hauled cattle coast to coast with a fleet of 20 trucks at times, including Mexico and Canada. He was a founding member of the Texas livestock hauling association and a lifetime member of the Southwestern Cattle Raiser Association. Anyone that knew him well knew that one of his greatest passions was the Feeder Cattle Industry. In his later years, he loved to attend his family reunions and cherished time with his cousins. C.H. was preceded in death by his parents, wife, Shirley and two great grandchildren. Mr. Parker is survived by his four children, Carla Reid of Graham, Bobby Parker of Breckenridge, Mike Parker and wife, Lytane of Breckenridge, Clay Parker and wife, Debbie of Breckenridge; one sister, Sandra Hayden of Dumas, grandchildren; Randal Reid, Keli Jo Bandy, and husband Jace, Scarlett Biddison and husband, Greg, Matt Parker, and wife Cassie, Kendall Parker and Katherine Parker along with 9 great grandchildren. Memorial contributions can be made to the West Texas Rehab Center or the Ben Richey Boys Ranch and may be left at the Melton-Kitchens Funeral Home. Condolences may be made online at www.meltonkitchens.com. "Email Address" would like to share the life celebration of Carlton "C.H." Parker. Click on the "link" to go to share a favorite memory or leave a condolence message for the family.